Scientists from universities in the United States, China and Australia have addressed a problem that has long challenged scientists: Seeing the structures of three dimensional cells with comparable resolution in each dimension. Cells are normally grown on transparent glass slides for microscopy examination. The technique uses the unique properties of light to create interference patterns as light waves pass through a cell on the way to the mirror and then back through the cell after being reflected. The interference patterns provide, at a single plane within the cell, significantly improved resolution in the Z-axis - what scientists see as they look directly into a cell perpendicular to the slide. This improved view could help researchers differentiate between structures that appear close together with existing microscope technology - but are actually relatively far apart within the cells. Microscope resolution in the X and Y axes is typically superior to resolution in the Z axis, regardless of the microscopy technique. The mirror approach works with super-resolution microscopy as well as with other technologies. Reported in the Nature journal Light: Science & Applications, the technique was developed by scientists at Peking University, the Georgia Institute of Technology, and the University of Technology Sydney (UTS). "This simple technology is allowing us to see the details of cells that have never been seen before," said Dayong Jin, a professor at UTS and one of the paper's co-authors. "A single cell is about 10 micrometers; inside that is a nuclear core about 5 micrometers, and inside that are tiny holes, called the 'nuclear pore complex,' that as a gate regulates the messenger bio-molecules, but measure between one fiftieth and one twentieth of a micrometer. 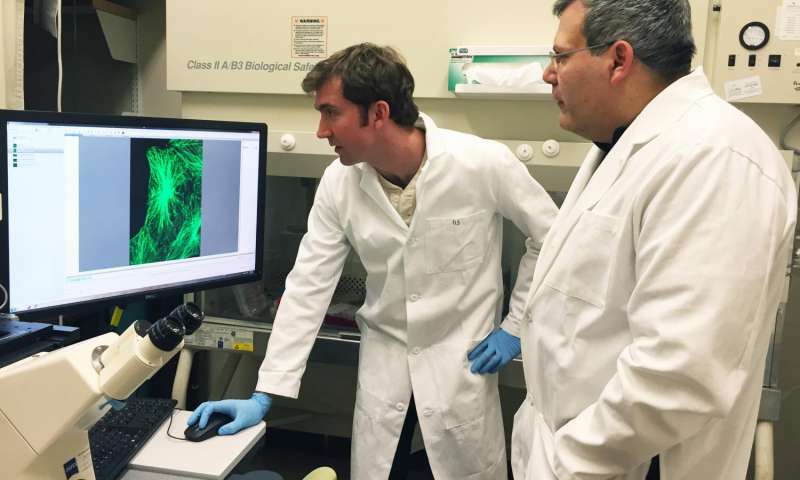 With this super-resolution microscopy we are able to see the details of those tiny holes." While changing the optical system was relatively simple, growing cells on the custom-made mirrors required adapting existing biological techniques, said Phil Santangelo, another co-author and a professor at Georgia Tech and Emory University. Techniques for growing the cells on the mirrors were largely developed by Eric Alonas, a Georgia Tech graduate student, and Hao Xie, a student in the Ph.D. program of Peking University and Georgia Tech. For scientists attempting to study structures and molecules inside cells, the interference effects can make a dramatic difference in what can be observed. "The two waves interacting with one another causes a region between the glass surfaces and the cell to be bright, and other parts to be dark," explained Santangelo, who is an associate professor in the Wallace H. Coulter Department of Biomedical Engineering at Georgia Tech and Emory University. "They cause light to be removed from some locations so you get darkness, and there is a bright spot in a specific region rather than being all bright." "There is more to do with this," he said. "We have demonstrated a basic topic that can be applied now in other ways." The time differences between Australia, China and the United States provided a challenge for the team's collaboration, but the researchers say the work was very worthwhile.